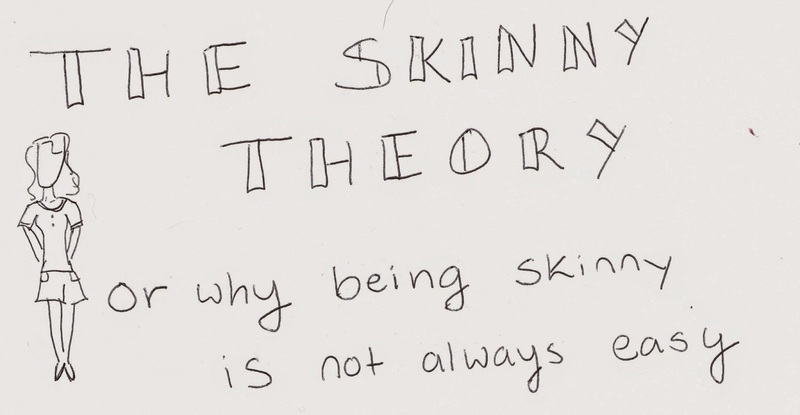 purely being her: the skinny theory. Graphic Drawn By: Rabekah M.
You know, that girl you called a stick figure? That was me. You know how she feels, not so great. Here is why. Being called a "stick figure", "twig", "super skinny", and a few more names can get tiring after a while. I never know if people mean it as a compliment or more like an "I am jealous" kind of way. Either way it can be hurtful. My usual reply is just a laugh and a smile. But what they don't know is that saying "you need more meat on your bones" or "what are you, a size double zero" can be just as hurtful as telling someone they are ugly. For me, when you say these comments something like this is implied, "Why are you so skinny? It looks unhealthy. I am jealous." Listen, there are no secret tips or tricks I use. I am skinny because I have a high metabolism and I choose to live a healthy lifestyle (note: being skinny does not mean you are healthy or vice versa, whole other blog post) and it just the way God created me. And for today, this is how I am. I do love the body God has given me and I do love my high metabolism (don't get me wrong that this is a post ranting about how much I hate myself and why it is your fault). I am proud of who I am and most of the time these comments don't get in my head. I make a choice to take it as an insult or compliment, but really - Do what your mama told you and if it is not nice don't say it. Telling someone that they are too skinny or questioning their eating habits is rude. Note: I know that there are exceptions to this and are those who choose to not eat or burn all the calories off but please don't think that of everyone and use it as an excuse to say it in the first place. I am not perfect. I call people things I shouldn't and we are all humans together, but we can all try a little harder together. Most of the time I don't think people mean it to be rude, but maybe we can all just think about what we are about to say before we say it and if it is really going to help or hurt that person. In the end, all I am asking is the next time you see her walking down the street, look at her in a new way and compliment her with kind words and think that maybe just maybe she is a normal girl living a normal life. Thank you to the moon and back for reading. xoxo. What do you think people mean when they tell someone these names? THIS is the story of me life!!! I actually filmed a youtube video about this and was going to put it on my channel but decided against it. I'm tiny, I can't help it. It's how my body was made. But I used (well still do) get really offend when people say "wow your so skinny". It's hurtful to me because I hear the words but I see the look in some of their eyes and when they ask me what are my tricks to staying this size I know it's not a full hearted compliment. Yes, there are the random few that don't mean it as an insult but I've been called so many things to know that not all the remarks are positive ones. Sorry this was longer than I expected it to be!! What a great reminder that even if we think we are saying something "harmless" our words are very powerful. I got "wow, your short!" or "why are you so short" a lot growing up (ah the irony, growing up.. and yet I'm only 4'11'' LOL!) I think people may be envious, not know what to say, and yes even jealous. Bottom line we could all do well to think before you speak... I've heard from a wise lady Lysa Terkeurst "is it true, is it kind and is it NECESSARY" if not, probably no need to say it! Thanks Moriah - wonderfully written as always! Wow, thank you for posting this! I have this problem almost every day in my life. Saying "You should eat more." to a skinny person is as insulting as saying "You should eat less." to a person who's not that skinny. Everyone's metabolism is different and ours happens to be really good working a super fast. You are not the only one, and I'm glad that I'm not the only one. We're all in this together girls! hello there. click on the picture to know more about me. get on my email listing (you would make my day). purely being her. 2013-2014. Powered by Blogger.